Last week, one of our readers asked a very important question. She wanted to understand why it was that a home for sale that she really liked had “funky” school assignments. In her particular situation, the house that she was considering was in the Woodson High School boundary (she used the Home by School interactive app* to find it). 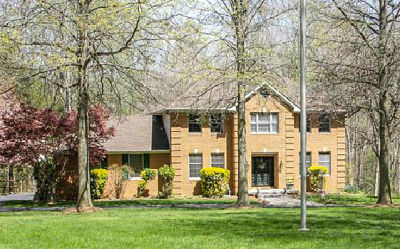 Once she found the house, she double-checked the schools on the home listing with the official boundary system at the Fairfax County Public Schools (FCPS) website . When she confirmed what the official FCPS school assignments were for that house, she found that while the assigned high school was Woodson, and the middle school was Frost MS (in the Woodson Pyramid), the elementary school was not in the Woodson Pyramid. Instead, the elementary school assigned to that house belonged to the Fairfax Pyramid. Could it be that the assignments were incorrect? 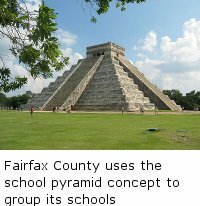 Or perhaps that the middle and high schools would be re-assigned in the future to the Fairfax Pyramid? I explained to her that this fall, the boundary for Fairfax HS and Lanier MS will be changing . As part of that change, many homes that used to fall within the Fairfax HS boundary will now belong to the Woodson HS and Frost MS boundaries. This explains why a home which up until this past school year had assigned an elementary, middle and high school all within the Fairfax Pyramid, starting this fall, will have an elementary school still in the Fairfax Pyramid, but the middle and high school will be part of the Woodson Pyramid. This is the situation that our reader encountered with the home for sale that she liked. 1. The official FCPS boundary system is Correct. 2. Our home by school app should be correct, since we do our best to keep our maps of homes for sale by school boundary up to date (but please double-check with the official FCPS boundary system). So which school assignments are listed incorrectly? So, what are smart home buyers to do? The first thing is to be aware that school information on any website that shows homes for sale in Fairfax County is probably incorrect. The second thing to do is to double-check the school assignments of each home for sale that you are interested in with the official boundary system of the school district. The third thing to do is to use our Home by School interactive app*, which we work very hard to keep up to date to make your life easier when looking for homes for sale by school. If you want a more detailed boundary drawn, for example, for an elementary school or a middle school, let us know and we’ll be happy to enable it for you. Access the Home by School interactive app (from a computer, not a tablet or phone) by logging into the site, accessing the Fairfax County Map of School Boundaries, clicking through to a high school boundary, and then clicking on the big, red button that reads “Find a Home”. 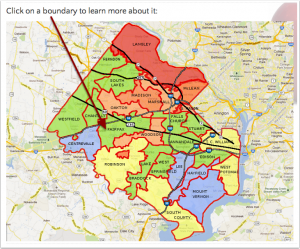 Fairfax County Schools (FCPS) Boundary Changes in 2014 How Fairfax County schools pyramids affect your home search Why you should choose a High School Boundary first Fairfax County School Boundaries: How often do they change?